Jack Caputo is gone. Without warning or fanfare, he slipped into the Everneath and took Nikki’s place. Without a word. Without her consent. His leaving has caused problems for Nikki on the Surface, with her Dad insisting on additional therapy, Jack’s mom accusing her of his disappearance and a detective tailing her, but none of that matters to Nikki. Luckily Jack’s brother, Will, knows the truth. Nikki has to save Jack. She’s his anchor this time, seeing him every night in her dreams. She tells him she’s coming for him, but she has no idea how to make that happen since Cole and the band have left Park City. Cole took Nikki very seriously when she told him to go away. But now she needs him to help her rescue Jack from the Tunnels, something that has never been done. And when she realized that Cole is in love with her, yet still agrees to help, she starts to believe that maybe he does have a heart after all. Everything that tethers her to Jack will be tested as Nikki navigates her way through the horrors held in the labyrinth. But if it gets her to Jack, then that’s all that matters. This is a great follow up to the first in the series, Everneath. We know all of the characters already; who they are, their strengths and weaknesses, what they want, who they love. Now we really see what drives them, what they are made of and how they work under pressure. My frequent criticism of the middle book in a series is that this volume acts more like a bridge between the introduction and the conclusion than a full-formed and equal part of the series. That’s clearly not the case here. There’s a lot of development in this book, from learning more about Cole’s history to hearing more Jack and Nikki tales to understanding why Cole is doing this trip through the maze for Nikki. The change of scenery to the Everneath and learning more about how it works adds a lot of depth as well. It is an eerie, fascinating and frightening place that is as much a character in this book as the humans and Everlivings. This book is hypnotic, exciting and heartbreaking. Any lover of myths especially will find it well worth the read. You might want to know: Ummm…I can’t remember if there was any profanity? 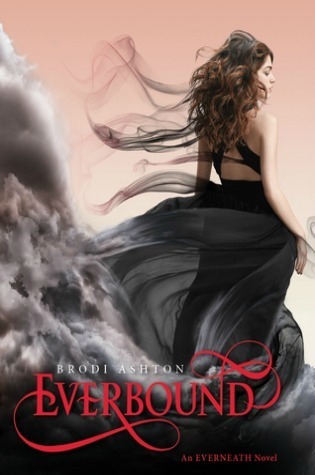 Everbound by Brodi Ashton was published January 22, 2013 by Balzer + Bray. Ink and Page picked this book up from the library, so no one had a choice about whether it was reviewed.